1. Colbert MD Illumino Anti-Aging Brightening Mask - I am already a fan of the Colbert MD Illumino Oil, so that fact that they made it into a sheet mask delighted me greatly. While many sheet masks focus mainly on hydration, I love that this one has ingredients like lactic acid to help give the skin a gentle exfoliation along with hyaluronic acid which provides the standard benefit of hydration and increasing skin's elasticity. There are also ingredients in this mask that help to target hyper-pigmentation and dark spots. No you won't see significant results the way you would with a serum or moisturizer that you use daily, but it is a nice added benefit if you are already trying to help reverse any scars, dark marks or sun damage. I actually make sure to save any of the liquid left in the packet once I remove the mask and pat it into the skin at the end so that I get every last bit of treatment that I can from these ingredients. 2. Tatcha Deep Hydration Lifting Mask - Tatcha has been a brand that has been a staple in my skincare routine for years. In fact they were one of the first brands I ever began blogging about, and they still remain a constant here. 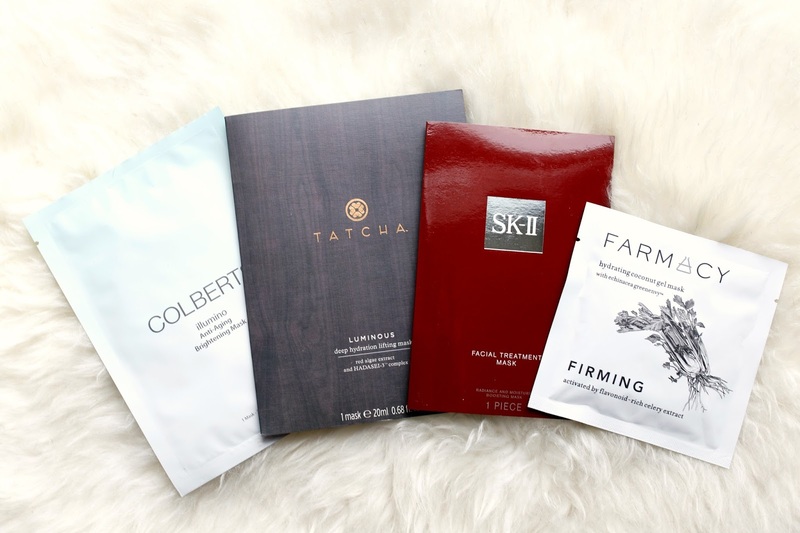 Their hydration sheet masks were the first one I tried out of all 4, and the results were almost immediate. My skin looked plump, firm, supple and felt as if I had just had the best facial of my life. I recommend these for anyone that struggles with dehydration, dry skin or is a frequent traveler. They will definitely save your skin when you need it the most. 3. SK-II Facial Treatment Mask - As an avid lover and user of the popular SK-II Facial Treatment Essence, this mask is one of the best ways to get the benefits of that essence in a quick, on-the-go option. And frankly, one mask is a lot more affordable than a bottle of the essence. While I leave most sheet masks on for 10-15 minutes, I like to leave this one on a bit longer (20-30 minutes even!) because I want the benefits of the Pitera to have extra time on the skin. I typically save this mask until I have to go somewhere special or have a big event because it preps my skin better than 3/4 of my entire skincare collection. My skin looks calm, awake, hydrated, firm and makeup applies flawlessly. There is a reason that it is in so many makeup artist's kits who do makeup for award shows. 4. Farmacy Hydrating Coconut Gel Mask - Farmacy is a new brand I was introduced to early last year and instantly fell in love with the entire line. The products blend nature with science and deliver wonderful results. This product from them was in my Best of Beauty 2015. Along with the lip balm, I enjoyed the Gel Masks the most. They have the most unique texture with their bouncy, cushion-like feel, and conform to the face better than any other sheet mask I have tried. While some sheet masks don't lay completely flat on the skin around certain areas (mainly the bridge of the nose and around the eyes), this mask is so incredibly pliable that it can adhere to the contour of the face. All of these masks sound fabulous. I've not really got into the whole sheet mask thing, but I will have to invest in a few to give them a go!